Experience Philly as never before! All aboard for a 45 minute aerial adventure over the City of Brotherly Love! From famous movie sites to the iconic Independence Hall, Philadelphia is town overflowing with amazing sights not to be missed. Rather than fight the foot traffic to see the landmark, why not take to the skies to see the sights and skyline it all its splendor? There’s truly no better way to see the city and its sights than from above. 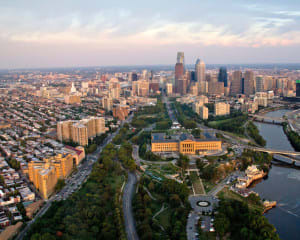 Departing from northeast Philadelphia, you’ll be immediately immersed in the beauty of Philly’s skyline. You’ll soar over such sights as Battleship New Jersey, Penn’s Landing, the Philadelphia Art Museum, and Boat House Row, all from the comfort of a Robinson R44 craft. With a strategic cockpit dome and a guaranteed window for each passenger, the R44 is perfect for an intimate flight and unrivalled views.